Cell phones are a part of modern life, so we can’t really ban them. And you are free to be as rude to your friends and dining companions as you’d like, but if you expect our staff to serve you, then you need to get off the &*$% cell phone. Vortex employees won’t talk to anyone using a cell phone at our host stand, tables or at the bar. Seriously, we will totally ignore you. In fact, using a cell phone while trying to place an order may result in bodily injury or death." Don't worry. The burgers are worth it! They have a whole separate section of the menu for their famous Bypass Burgers. They come in single, double, and the infamous triple (aka, the Super Stack). 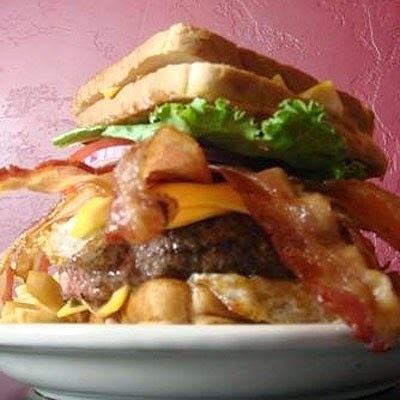 That's three half pound patties, 14 slices of bacon, 10 slices of cheese, 3 fried eggs, and nearly a bottle of mayo - on the side. We recommend the single if you want to walk out of the restaurant and do other things on your adventure. It's only a single fried egg, 3 slices of cheese, and 4 slices of bacon. Way to diet! Wash it down with Sweetwater 420. ($20 per person). Notes: There's actually two locations - one in Midtown and the original in Little Five Points. We are showing the Midtown location in this post, but both are great. If you want the classic Vortex crazy eyes skull, go to the Little Five Points location.